Dominion Sure Seal's Professional Glass Cleaner is the # 1 glass cleaner as used by the professionals. 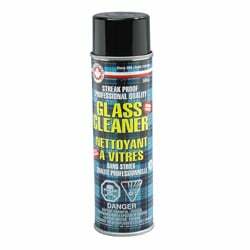 This ammonia fortified, fast acting glass cleaner offers a medium foaming cleaning characteristic that will leave all surfaces clean and free of all contaminants. Simply spray on and wipe off. Safe on most quality window tints. Will not streak or leave a greasy film. Perfect for the most soiled surfaces.